The word cancer has percolated in our very dictionary not just as a disease but also as a psycological threat. We happen to come across many people who ended up being fighters and not survivors. These two words can make all the difference. But before we get into this debate lets understand as to what is cancer? It is a dis-balance in the orderly fashion of cell multiplication and death. Sometimes certain triggers also known as carcinogens (radiation, cigarette smoke, tobacco, food coloring agents) initiate uncontrolled cell multiplication which might lead to cancer with a mass of tissue growth or tumor. There are various types of cancer that can prevail in our body like, blood cancer, stomach cancer, liver cancer and oral cancer. All cancers talked above have their scientific name attached. But not digging very deep we will just talk about Oral Cancer. 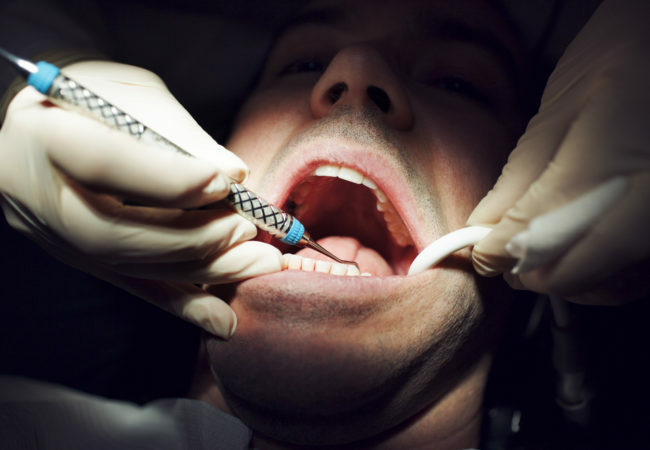 Oral cancer is a group of cancer developed in the oral cavity mainly tongue, lips and cheek. There are certain risk factors in developing cancer like use of tobacco, smoking cigarettes, chewing tobacco, excessive intake of alcohol and excessive exposure to sun. All these can cause cancer which ultimately has dangers attached to it such as, Spread of cancer is cause of worry. Medically we call it as Metastasis i.e. spread to distant organs. Once the distant organs are affected they reduces the life expectancy of the patient. But the question that stuck us is, how to stop cancer in the first case? Many dentists believe that early detection is the key to decrease the chances of Oral Cancer and in this your dentist plays a pivotal role. A thorough check-up of oral cavity mainly the tongue, inner aspects of cheeks, and the parts below the tongue is essential. Any suspicious growth of tissue (tumor) should be noted and proper investigation should be taken in the form of biopsy, smear, tissue scraping etc. Any sharp, broken margins of tooth should be removed since these can cause non healing ulcers leading to cancer. These are the symptoms which are noted by your dentist during a dental visit. Once the symptoms turns positive then there is a treatment module which should be followed by the patients ti fight back this deadly disease. A considerable improvement has been achieved in the field of Oncology (study of cancer). Various treatment modality like chemotherapy, radiotherapy, surgical therapy are available at various hospitals. Certain newer advancements in the field of immuno therapy, hormone therapy, vial therapy, gene therapy give a streak of bright hope in the research of cancer. Successful stories are being carried out in the field of research. One has to undergo these treatment modalities to prevent the spread of cancer. Till date we do not have a complete cure of the same. What we hope of the future is victory over this dreaded disease. With advancements of new technologies there is a possibility to achieve this in near future. And as the Irish proverb goes, “hope is the physician of each missing”.